German ortographic changes +ESZETT (ß / ẞ) supported by Hyphenator and Speller version 6.2.3.9. Updates Norsk, Svensk, Dansk, Suomi and Frysk for the development release of *TALŌ's Hyphenator and Speller 2019. *TALŌ™ is a Netherlands-based software company, specializing in the development of language modules. We conceived, designed, and developed the *TALŌ hyphenation system from a psychological, cognitive, and language perspective. The system is based on a unified structure for syllabification, that works in every alphabetical language. Our first product was called the “Dutch hyphenator”, and was integrated into the Dutch version of WordPerfect in 1985. Our next step was building a software generator to create hyphenators for other languages. With this advanced generator, the development of hyphenation modules will take us only a few months. 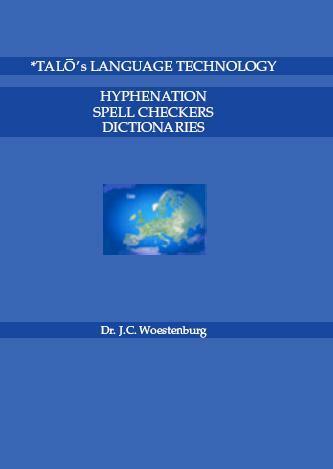 The hyphenator modules were followed by the development of spelling modules, based on the same language principles as the hyphenation modules. Our creation of the hyphenator or speller always begins with thorough knowledge of the language. The general rules of hyphenation and spelling are dictated by leading language institutes and academies. The impact of these rules on language technology cannot be neglected. Since the first implementation we at *TALŌ have made significant progress in the development of hyphenators and spellers for the European, Asian, and African languages. We have also put considerable effort into improving both the underlying scientific principles and the technical realizations. You can count on *TALŌ language modules for reliability and speed, that is why you will find our modules throughout Europe, the Americas, Asia and Africa. They are integrated in larger financial, larger insurance, and editorial systems. At the present time, you can be provided with language modules for nearly any European language (Catalan nova ortografia, English, German, Dutch, Swedish, Danish, Norwegian, Finnish, French, Italian, Spanish, Portuguese, etc. ), the Middle Eastern languages (Arabic, Hebrew, Persian/Farsi, Kurdish), the Asian languages (Kazakh, Khmer, Urdu, Hindi, Marathi, Bengali, Gujarati, Malayalam, Tamil, Nepalese, Sinhala, Thai, Bahasa Melayu & Indonesia) and the African languages (Zulu, Xhosa, Afrikaans, Swahili). Many reviving languages of minorities have been included too. All official languages of the 35 members of the European Union are supported and the Portuguese acordo ortográfico is implemented into the system. We continue to develop other modules. The language modules have been grouped together in shared libraries. The differences in language processes are encapsulated to facilitate an integration with the OEM's particular system, either as a runtime linkable library or as a coherent set of sources. The shared libraries can easily be plugged into smaller systems (see Library System Design).